The Rusty Nuts Super Tour - 10,000km in ten days has just been completed and a big congratulations to the 17 riders who were hard enough to complete the event. 2,000km in two days was enough for me on the TT. Found this wee article on the web but I'm looking forward to Lee's next Rusty Trumpet and perhaps a write-up or two on KiwiBiker. A great spot to stop for breakfast prior to attacking the Haast Pass, Makarora is about 30 minutes out of Wanaka. The below video is Brian and I leaving Makarora and heading on towards Haast. Wow, Google/Blogger have finally offered up a few new features including the ability to add pages to a blog and customise a blog's template. I've just had a wee play with these features and I think it's given the Blog a bit of a freshen up...comments? Here's another 3 videos from the TT2000 trip. This is day six travelling from Queenstown to Wanaka via the Crown Range road - a fantastic ride and yes, those hairpins are signposted at 15km/h. The videos only go as far as Cardrona where we stopped at the historic Cardrona Hotel for a hot drink. I've started the onerous process of editing some of the video I shot on the TT2000 and here is the first three. They make up a fair portion of the Takaka Hill - 28km of corners and by the time we got to this part of the ride we already had about 900kms under our belts for the day. It's a great ride and certainly wakes you up! Well, I'm back from the TT2000 and what a great time I had. Brian and I covered just over 5,000km and really only had 2 days of bad weather. 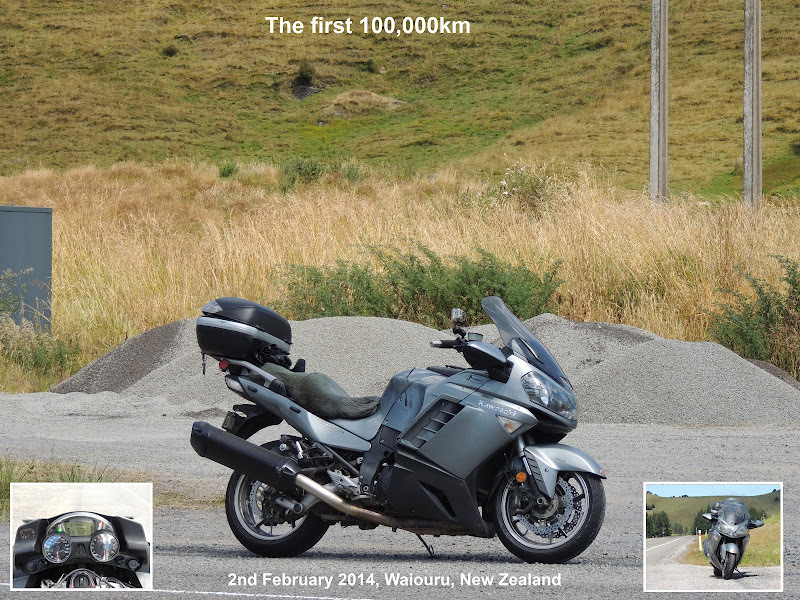 The TT itself was great fun with 1,000km days pretty easy to cover in the South Island. The rest of the trip was also a lot of fun with plenty of miles to ride and some great sights to see. The standard muffler on the Connie has always drawn criticism for it’s size and design – the one ugly feature of the bike. Most owners rectify this by immediately fitting an aftermarket muffler. I haven’t wanted to go this route as I quite enjoy the fact that the Connie is a quiet bike (as opposed to the Honda which is a yeller), especially when on a long trip. A few of the guys on the Concours forum have experimented with painting the aluminium end cap and heat shield in various shades of black and I quite liked the look. So when Brian offered me the end cap and shield off his muffler (he’s fitted a stainless pipe) I jumped at it and took them in to get powder coated. And below is the result – I think it looks quite good and perhaps make the muffler look a little smaller. Sick of the feeble standard horn on the Connie I’ve now installed a Stebel to strike fear into the hearts of dodgy motorists! It took a little bit of doing but with the help of my old man we finally got it wired up correctly and the sound is most pleasing. Now I’m tooting like crazy! After two weeks of recovering from throwing my poor little Honda down the road it was time to get out and do another Friday night ride. At the usual time I met up with probably 6 or seven others at Ashhurst and after the usual about of crap talk we had to settle down and decide where we were heading. We finally settled on the Saddle, Topgrass Road, Oringi, Hopelands and then back to Ashhurst. I led off over the Saddle with a snarling GSX-R600 (no muffler) behind me and had a great run although there were a few dampish corners and others with loose metal on them. After a brief re-group Al led us off along the ranges. Riding up one small hill we came upon a lot of unmarked and nearly invisible new seal. It was difficult to see as the road was also slightly damp and after having a wee moment Al actually pulled over to see if he had a puncture. After a bit of cursing at the idiots who had done the resealing but not left signs out or swept the road we carried on. I led again and missed one crucial turn but we still ended up at Oringi and onto the very nice ride through Jacksons Road. After another quick regroup we followed Al again as he took as through Hopelands. Riding through here we had to put up with a couple of showers but the ride was still enjoyable. A short ride through to Woodville and then through the gorge to Ashhurst and the ride was done. At the pub I caught up with a few more of the others before calling it a night and heading home. I had a great Friday night ride with the guys. We’d had a blast doing the Apiti Loop in pretty short time before finishing up at the Ashhurst Pub for refreshments. Enjoyed the relaxing for a while but eventually decided it was time to head home. Supersonic and I fired up our bikes and took off. As per usual when I the Honda I popped a little wheelie and landed it reasonably ok but then my trouble started. It had been quite a hot day and as I was braking for the turn onto the main road my front tyre came into contact with some hot tar. The next thing I know is that I’ve lowsided and am sliding down the road watching the Honda do the same. As I was sliding down the road I can remember thinking: damn metal on the road! Luckily I was not going that fast and didn’t really hurt myself so I was up in no time running over to check the bike. The Honda had landed pretty hard on it’s left hand side and with various bits bent and broken was going nowhere – damn! Supersonic pulled up and came over to see if I was ok and find out what had happened. It was him that discovered that it wasn’t metal on the road when he spotted skid-marks in the hot tar – unbelievable, it was 9 o’clock at night! Anyway, after a fair bit of nutting off at myself for being so stupid to fall off, I got myself sorted and pushed the bike back to Meanie’s and then the pub to share my tale of woe. Later on Meanie and Sarge helped my load the bike onto Meanie’s ute and get it home – very much appreciated guys! I ended up with a decent bruise on my thigh and a very sore thumb but otherwise pretty much unscathed – even went to the AC/DC concert the next night. My gear did it’s job and my Spidi pants are now toast and my old Nazran jacket has a torn sleeve. My helmet never hit the ground so it’s ok and my Alpinestars gloves will live to see another day. As for the bike, there is as I said quite a lot of damage to it but luckily it has not been written off and is in the process of being nailed back together. Yet another fabulous Saturday and after walking the dog it was time to get the Connie out of the shed. Brian had been wanting to go for a bit of a decent ride prior to getting his bike serviced for the TT2000 so after a bit of humming and harring we decided on hitting the Parapara’s and Fields track. We left Palmy just after 10am and made our way to Halcombe via Mt Stewart. From Halcombe we made our way to Marton and then took the same fantastic back roads that Mark & I had ridden in the rain a few weeks earlier to Wanganui. This time around the roads were dry and a lot of fun. We also had great timing as we went past some farmers just as they were about to bring some cattle out onto the road – any later and we would have been stuck somewhere in the middle of the herd. In Wanganui we stopped for gas before attacking the Parapara’s. Once again the Para’s were in great nick and we had a lovely ride through to the Feilds Track turn-off. The only downer was having to stop for roadworks a couple of times. Fields track was fantastic as well. I haven’t ridden it very often in the direction we took (northerly) but it was great winding our way up the hill and enjoying the great views on offer. Added to this was the lack of traffic – we did not see another car until we were nearly back onto SH49. Also absent was stock on the road and there was not too many issues with gravel across the road. At the main road we turned left and pottled on to Ohakune where we stopped and had a nice steak sandwich before deciding to ride up to the ski field. Unfortunately they were working on the road so we could not make it all the way up but we were able to stop and get a quick view of the mountain before turning around and riding back to Ohakune. Now it was decision time again and because we’d enjoyed the Para’s so much on the way up we decided to give them a second go. As it turned out they were just as good the second time around with the only issue being a mob of sheep being moved along the road – after a five minute hold-up we powering off up the road again. Nearing Wanganui we turned off on a detour which meant that we didn’t have to go into Wanganui and came out on the Fordell road. This was actually quite a nice ride and had two particularly good sweepers on it which will need to be revisited again at some stage. From Fordell we took the back roads all the way through to Hunterville. The ride was hardly uneventful with plenty of wildlife to avoid along the way – Brian had a very close call with a couple of sheep, then there were turkeys and even a bloodhound (eating some roadkill) to avoid! Never the less we made it to Hunterville all in one piece and after a bit of discussion decided that we probably had enough fuel to get home via Vinegar Hill. So off we went. After a bit of spirited riding over the Hill my fuel light finally came on in Bunnythorpe – no problem though I made it home easily after clocking up another 350km on that tank of juice. Another great day out on the bike with a ride of around 440kms all up – roll on the TT! Loving the look of this beastie! I've been a bit slack in my blogging lately but I've actually got quite a bit to write-up when I get around to it. I've got the next 2 weeks off but will be away for about 10 days on the TT2000 so I'll have to try and get up to date before I go. 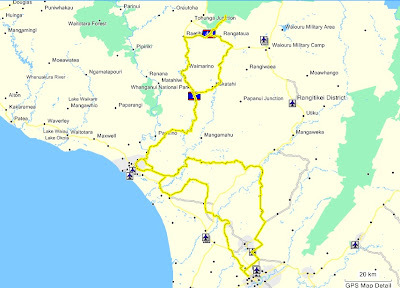 Meanwhile, tomorrow is the Apiti Scamper, a charity ride to raise funds for Ronald McDonald house so I'm looking forward to that (and that's another write-up I'm gonna have to do) and there's more preparations to be done before the TT.